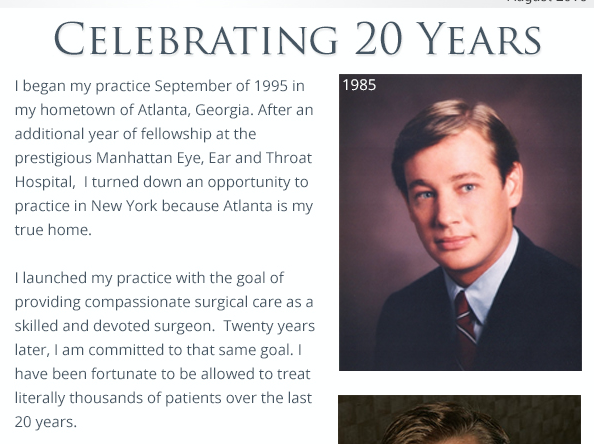 For the past twenty years, Dr. Crispin has made a huge impact on the surrounding Atlanta area by helping each of his patients look their absolute best. Each year, Dr. Crispin has grown as a plastic surgeon and received multiple accolades in this field as a result of his time and dedication to his practice. This would not be possible without our patients. We are incredibly grateful for the support you have given us since we have opened our practice. As we celebrate these twenty amazing years in business, we are offering patients 10% off any surgical procedure for the month of September. Appointments can be scheduled for any date, but they must be paid in full by September 30, 2015. To schedule an appointment with Dr. Crispin or learn more about our procedures, please call 404-257-9888. Here’s to many more years serving our beloved clients!